Voice Your Vision for the Smithsonian’s Future. Art and luxury hotels in Madrid. As a museum-lover, I would argue that any day is a good day to visit a museum. However, there are days when spending your time inside is not altogether desirable. Thank goodness someone invented botanic gardens and arboretums (apparently the first true botanic garden was the University of Pisa physic garden in 1543). May 3rd was one of those beautiful spring days in Chicago where people break out the shorts (and the skin that hasn’t seen the sun in months) and head to the nearest beach/lake/park/beer garden/ice cream parlor/or back porch. My roommate and I were no exception, we hopped in the car and headed north to Glencoe and the Chicago Botanic Garden. 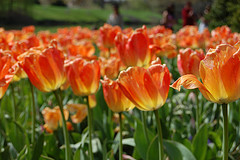 The Chicago Botanic Garden, which consists of 385 acres, is one of the most visited public gardens in the United States. On their website they describe their location as on the “outskirts of the city,” which is apparently one way of describing the suburb of Glencoe that lies about 21 miles north of the Chicago. A scenic way to get there is to drive up Sheridan Road and explore the city’s northern suburbs. However, there are two Metra train stations that serve the garden if you would rather not drive. Another note on driving, while admission to the gardens is free, parking is $20. Once at the gardens, you can wander among the 23 distinct display gardens and a variety of natural habitats. These include a Bulb Garden, Model Railroad Garden, Prairie, Fruit and Vegetable Garden, Japanese Garden, Dwarf Conifer Garden, and Rose Garden. Some areas are more crowded than others, but with so much space to explore it is quite easy to find some peace and quiet. One thing that I particularly enjoyed about the Chicago Botanic Garden was their labeling and signage. 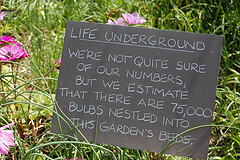 Throughout the gardens there are small handwritten signs that are both informative and entertaining. These signs do much to make the collection come alive for visitors, creating new ways of looking at what just appear to be pretty flowers at first glance. For those interested in becoming more than just a visitor, the Chicago Botanic Garden offers plenty in the way of events and opportunities to get involved with the work of the garden. For instance, you can volunteer with tending the gardens, be a research assistant, staff the membership and information desk, lead garden tours, or lend a hand at festivals. The Wellness and Lifestyle Program gives visitors an opportunity to sign up for yoga and tai chi classes in addition to fitness walks through the gardens. The three-day plant sale beginning on May 15 will not only serve as an opportunity to buy some plants or flowers to take home, but it will also serve as an opportunity to learn about growing your own produce and small-space gardening in order to help us all be a little more green. Take classes at the Joseph Regenstein School of the Botanic Garden or do a little horticultural research of your own at the Lenhardt Library. There are also events like wine festivals, concerts, farmers’ markets, an Italian cooking weekend, and a kite festival. Long story short, there is a lot more than plant growing going on in these gardens. 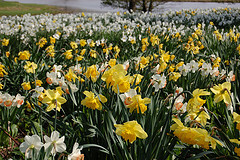 There are currently around 1775 botanic gardens and arboretums in 148 countries. So, next time you are faced with one of those beautiful days drop by your nearest botanic garden or arboretum for an educational and entertaining afternoon in the sun. May 11th marks the 151st birthday of the great state of Minnesota. The second northernmost state in the Union (with Alaska rather obviously taking the title on that one), the land of “somewhat clouded water” has quite a bit to offer residents and visitors alike. Let’s start with some quick facts about Minnesota. Hibbing, Minnesota is home to the bus industry in America, specifically the line that would become Greyhound Bus. Both the Milky Way and 3 Musketeers candy bars were introduced in Minnesota. 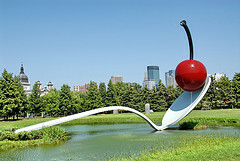 Other things in Minnesota: the world’s largest ball of twine (in Darwin), the stapler, Rollerblades, the first children’s department in a library (Minneapolis Public Library), the Mayo Clinic, the world’s largest pelican, and the world’s largest urban sculpture garden. Minnesota has the most recreational boats per person of any state in the nation and the most golf courses per capita. Minnesota, with 90,000 miles of it, has more shoreline than California, Florida, and Hawaii combined. Speaking of shoreline, you might have heard that Minnesota is the “Land of 10,000 Lakes.” Well, there are quite a bit more than 10,000 – the exact number I will leave for other people to debate – and a fair number of museums that touch on the state’s watery abundance. The Official Minnesota Fishing Museum and Education Center in Little Falls, the North Shore Commercial Fishing Museum in Tofte, the Minnesota Marine Art Museum in Winona, the Lake Superior Marine Museum Association and the Great Lakes Aquarium in Duluth are just a few. Lakes are not the only liquid attraction in the North Star State. The headwaters of the Mississippi River can be found in Lake Itasca, a noteworthy monument that you should probably visit in the summertime. Looking for a little history about the state as a whole? Start with the Minnesota Historical Society, which is currently hosting a cartography exhibit entitled Minnesota on the Map as well as the MN150 exhibit exploring 150 things that make Minnesota the way it is. Most counties in Minnesota have historical societies of their own. Visit the Minnesota Association of Museums’ website for a complete listing of these institutions. Paul Orselli’s latest: here, here, and here.